It was my second Sondheim musical in a row - that's what I call a good weekend! The day after attending the opening night of Theater Latte Da's beautiful production of Company, I headed out to Bloomington to spend my Sunday in the Park with George. 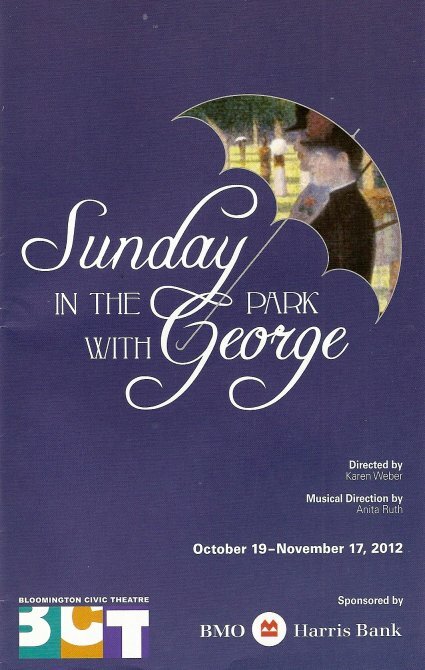 Unlike Company, I'd never seen or heard Sunday in the Park before; all I knew about it was Sondheim, art, and original cast members Mandy Patinkin and Bernadette Peters. But that was enough to make me want to see it, and it was actually one of the reasons why I chose to buy a season pass to Bloomington Civic Theatre this year (the first show was the big dance musical 42nd Street, and the season continues next year with one of my faves, Cabaret, and On the Town). 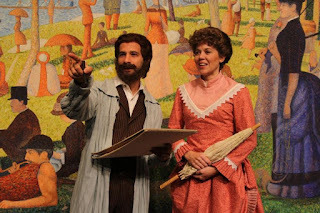 The inspiration for this musical was the 19th century painting "A Sunday Afternoon on the Island of La Grande Jatte" by Georges Seurat, one of the leaders of the Impressionist movement. Sondheim and frequent collaborate James Lapine imagined the story behind the painting, both the painter and his subjects. In doing so they explore the ideas of art and creativity and being obsessed with one's work to the point of ignoring everything else. 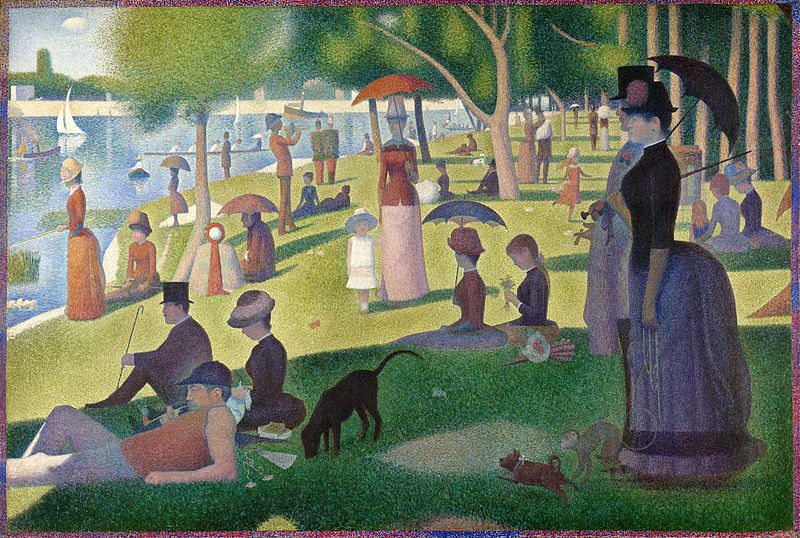 The first act recreates the above painting by introducing the figures as people George meets in the park where he goes to paint. The woman on the right with the parasol is his model/lover Dot (named after the dots or blobs of color George uses to create his pictures). She sings about how hot and uncomfortable it is to stand without moving in the sun, but she does it because she loves George, and he teaches her how to concentrate. Other figures we meet are the man standing next to Dot (Jules, a painter friend of George), the woman in the center with the orange parasol with the little girl in white (his wife and daughter), the man lounging on the left (a boatman), and several others. Unfortunately, the world is not as ordered as George wants it to be. Jules and his wife have an unhappy marriage, and Dot leaves George when he seems to care more about his painting than her. At the end of the first act, things descend into noisy chaos, until George moves everyone into place to match his vision, and the painting is alive before our eyes. The second act takes place in a museum 100 years later, where the figures jump out of the painting, and we meet George's great-grandson, also named George, also an artist. The story delves into the nature of art, artists, and commercialism vs. staying true to one's art (similar themes as in the play Red about painter Mark Rothko). Act II has a very different tone than the Act I, and I found myself wanting to return to the world of the painting. In my research (i.e., Wikipedia), I ran across this quote the New York Times review (by Ben Brantley) of the 2008 Broadway revival, "Sunday remains a lopsided piece - pairing a near-perfect, self-contained first act with a lumpier, less assured second half." But fortunately, things take a satisfying turn at the end when young George returns to the island in the painting and is able to achieve some resolution for his great-grandfather, who died young. The show may be called Sunday in the Park with George, but for me the star of the show is Jennifer Eckes as Dot (and as young George's grandmother Marie in the second act). In addition to her beautiful voice on these challenging Sondheim songs, she gives Dot such heart and spirit, with such a longing for a better life, that I couldn't help rooting for her and thinking George was a bit of a jerk for letting her go! Joey Clark also gives a fine performance as George (completely unrecognizable under the wig and beard), and manages to make George likeable despite the fact that he makes some bad choices and pushes everything and everyone away for the sake of his art. It's nice to see the modern George learn some of the lessons his great-grandfather was not able to. Other standouts in the cast include Kelly Krebs and Beth King as the obnoxious and spoiled American couple, and Alan Sorenson and Megan Volkman-Wilson as Jules and his wife. They also play characters in the second act, but as I mentioned above, I found the first act much more memorable and moving. Finally, Anna Evans (one of the Cocos in Coco's Diary at the History Theatre earlier this year) is a little scene stealer as the mischievous girl in white. The costumes and set are so important to this piece, because the audience has to believe that these characters came out of the painting, and BCT does a beautiful job creating the effect (set by Robin McIntyre and costumes by Ed Gleeman). The white set pieces we see at the beginning are removed to reveal a large-scale replica of the background of the painting, with trees dropping in from overheard. The costumes are exquisite and look very similar to the painting (including impressive bustles!). At the end of the first act a scrim is lowered at the front of the stage with the image of the painting on it, in front of the live action painting arranged on the set, and it's a spectacular effect. Last but not least, a highlight for me of any BCT show is the traditional pit orchestra led by Anita Ruth. The music sounds like George's painting, and he often paints to the music - short and staccato, in unexpected blobs. It's a great time for Sondheim, and this show is a nice pair to Theater Latte Da's Company. With every additional Sondheim show I see, I feel like I'm "Putting It Together" a bit more and understanding his work a little bit more. I've seen several shows since I heard him speak two and half years ago, and it's been fun. Next on my Sondheim wishlist is Assassins, which I've never seen. But until then, go see these two wonderfully different but quintessentially Sondheim shows! 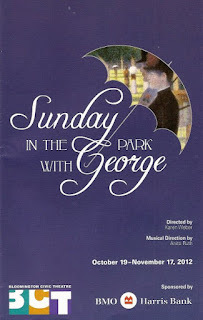 Check out the BCT website for more info on Sunday in the Park with George, or take advantage of the half-price tickets available on Goldstar.com.